Simple exercise for refocusing students or reducing anxiety. ​ 1 thing you can taste." Card available for printing, click link below. View video for explanation on how the 3x3 method works. Mindfulness explained to adults in 2-1/2 minutes. Lots of apps out there, it's a matter of finding the one you like. I like the Ausie voice on Headspace. Let me know if you find one to add to the list. Buffet; no set meditations; most popular free app. 15-20 minutes. 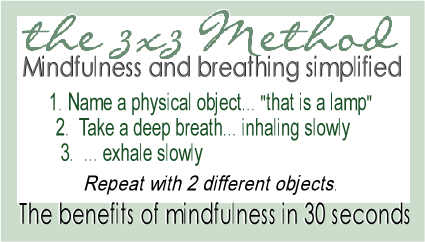 3 minute mindful breathing; simple good for beginners; stress, anxiety, depression. Includes gratitude journal. Has sleep stories; 16 free meditations. Free for schools and educators. Breathing, visualization for anxiety, audio exercises; good beginning activities.